Chances are pretty good you’ve been to Punxsutawney or Jersey Shore, but have you ever been to Daguscahonda, Tidioute, Panic or Torpedo? 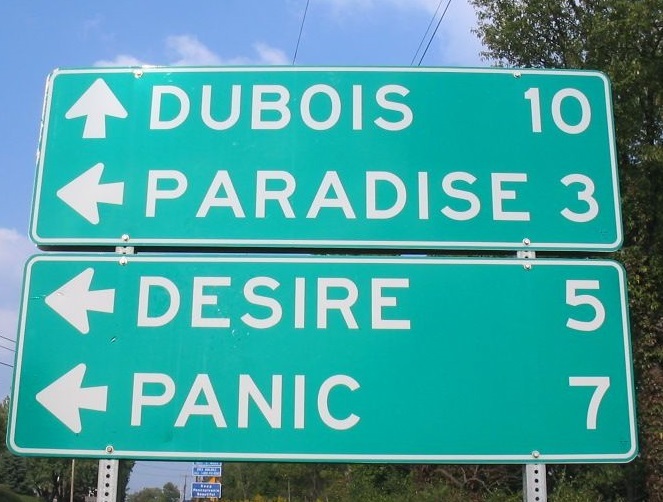 Or, maybe Desire, or Paradise? Pronounced “tid-dee-OOT”. Always a fun word to say. In the Iroquois language, Tidioute means “protrusion of land.” A sharp turn in the Allegheny River in this borough creates a mini-peninsula effect. However, yet another historical entry says Tidioute is an Indian name meaning “log trap place” where Indian tribes often trapped deer at the mouth of various streams flowing into the Allegheny River nearby. OK, where’s the ocean? The sign says Jersey Shore, so the Atlantic can’t be much farther down the road, right? Actually, New Jersey and the Atlantic are more than 165 miles from this Pennsylvania Wilds town. 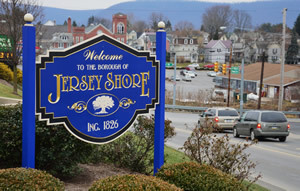 Originally called Waynesburg, Scotch-Irish families who began settling on the West Branch Susquehanna River referred to Waynesburg as the “Jersey shore” because most of them were from New Jersey and moved to the area to establish farms after the Revolutionary War. For over 30 years, both names were used to describe the settlement. However, as more and more people came to settle here, the official name Jersey Shore won out. This is one of the more truly bizarre stories of name origins we came across in researching this article. According to legend, a Native American sorcerer began attacking the European settlers, much to the dismay of a tribal chief, who ordered the sorcerer killed and his body burned to destroy all of the “evil spirits”. However, the sorcerer’s burning body instantly turned into swarms of sandflies, insects which the Native Americans called “ponksad.” This scourge plagued the tribal village for years and they began calling the village “Ponksaduteney,” which translates to “the town of sandflies.” As noted by punxyhistory.org, the sandflies are gone, but “the ghost of the spelling” is with us to stay. The name of this town has nothing to do with frogs, leaping lizards, or lover’s leaps. The town derives its name from lumberman Charles Leeper, of Leeper, Arnold & Co. There is conflict, confusion and controversy here. Historical writings show a Centre County town named after settler George Pancake, but there is yet another Pancake, Pennsylvania (also named for George) located south of Pittsburgh. At any rate, George Pancake was featured in an illustration in a 1971 LIFE Magazine article on strangely named towns in America. In the 1800s, huge flocks of passenger pigeons inhabited the forests between Kane and Marienville. An article in The Forest Press reported that the passenger pigeons were so numerous in the 1800s they “blotted out the sun.” Unfortunately, the birds are extinct because they were easy prey for owls, hawks, turkey vultures and wolves. Seneca tribesmen also found them to be an endless food source. Coming up with a name for this village required no imagination whatsoever. According to early writings, it was where a settler found a lone snowshoe hanging from a tree. The rest is history. Located between Ridgway and St. Marys. The name Daguscahonda means “True Water” and was given to the locality by an elderly Indian chief who pitched his wigwam where the village now stands next to Elk Creek. It is considered the geographic center of Elk County. The area also gained notoriety in 1885 when a chicken burst forth from its eggshell walking on four (yes, that’s right), four, perfect legs and made animal history as one of nature’s strangest freaks. Some historians say it is named for widespread panic, which ensued due to an economic recession in the 1800s. Another unattributed account said panic set in among townsfolk in 1872 when it came time to establish a post office and the postal service told them the town’s original name was already taken. As legend goes, with the naming deadline rapidly approaching, the village’s leaders couldn’t agree on a new name and “panic” ensued. One of the residents suggested they simply call the town “Panic” and on this, everyone agreed. Perhaps this tiny location was named for a hankering, or a burning and yearning desire for a place to call home? Little is known about the town’s name origin. Origin of the name is also not clear, but obviously a highly desirable place to live – and all photographers agree, it’s a great road sign! We conclude with the story of a location which was almost blown right off the map during the oil boom (pun intended) of the 1800s. Torpedo got its name from an incident involving tubes of highly volatile nitroglycerin called “torpedoes”, which were used to enhance the flow of oil to the derricks. According to the County Historical Society, a horse-drawn wagon containing 880 pounds of glycerin torpedoes got stuck at a railroad crossing when one of the animals caught its foot between the rail and a plank and collapsed. The wagon driver tried to free the trapped animal but couldn’t get it to budge. Hearing an approaching train’s whistle, he cut the other horse free and feverishly began to unload his explosive cargo. He had quickly removed roughly half of the nitro-torpedoes when the train roared around the bend and he took off running for his life. Aboard the locomotive, the train engineer hit the brakes, but the short distance to the crossing and the speed of the train prevented it from coming to a full stop. What happened next was a pure miracle. The locomotive hit the trapped horse, cutting both legs and tilting the wagon halfway on its side before finally coming to a stop. Miraculously, the glycerin did not explode. Had the wagon been knocked completely over, an explosion of Biblical proportions would have caused mass destruction and loss of life. When the dust cleared, the horse was shot by one of the train’s passengers to put it out of its misery, and the conductor and passengers, startled by the sudden stoppage, hardly realized what a close brush with death they had with a wagon load of nitroglycerin-filled torpedoes. Not long afterwards, the name “Torpedo” was forever ensconced as the name of this tiny Warren County locale. This was just a handful of uniquely named towns and we’re sure there are plenty more across the 13-county Pennsylvania Wilds region. Let us know about them in the comment section!